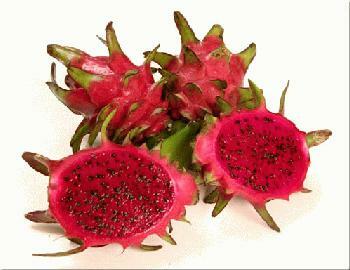 A dragon fruit is a form of tree climbing cactus that has a beautiful night blooming flower. There are many varieties and the fruit is very attractive and delicious. Commonly chilled and served fresh this attractive fruit has mild combined tastes of pear, kiwi and watermelon adding to its culinary versatility. The fruit is packaged in 10 lb boxes and must be shipped 2nd day air or 3 day select. Refrigerate immediately upon receipt. BE SURE TO SET THE QUANTITY TO 10 OR GREATER ! !